"San Miniato" is located in the lower Arno valley, on the south-eastern hills dominating the river plains, halfway between Pisa and Florence, in Tuscany, Italy. 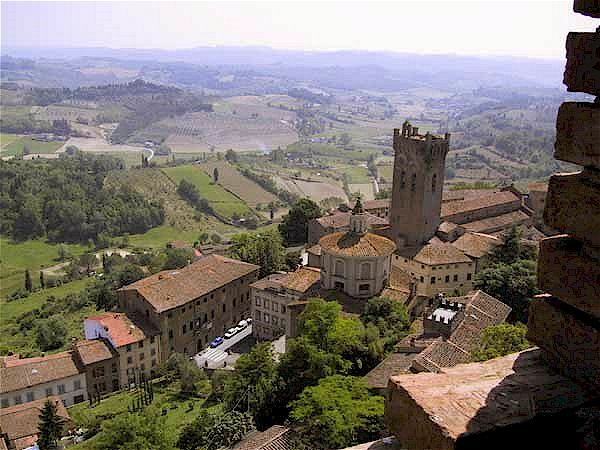 The mediaeval village of San Miniato is in the centre of Tuscany and it preserves an historic centre set on the hill top with the Cathedral, the Episcopal Palace, the Municipal Palace and the Tower Fortress dominating all the surrounding Arno, Era and Egola valleys. San Miniato was historically known as "San Miniato al Tedesco" to distinguish it from San Miniato al Monte, famous for its exquisite church and located just above the Piazzale Michelangelo in Florence, Italy. and host of an excellent truffle festival. buying truffles and truffles in general. during the last three weekends of November. There is also a Truffle fair in San Giovanni d'Asso, SE of Sienna, on the second and third weekends of November. San Miniato is a Città Slow - a "slow town" of Italy. The municipal territory of San Miniato, situated in the Lower Valdarno, covers 102 sq km on the heights dominating the plain of the Arno between the valley of the Egola and the Val d'Elsa. San Miniato is an extremely ancient settlement, as is demonstrated by the discovery of prehistoric artifacts in the area. San Miniato's importance in the Mediaeval period was above all due its position at the meeting point of the rivers Arno and Elsa, and of the road from Pisa to Firenze and the Via Francigena. Its origins seem tied to a village developed around a chapel founded in the 8 C and given in yearly lease in 938 to a noble from Lucca. It was already highly populated and surrounded by a moat in 999, and it was fortified in the XII C. In 1178 and 1185, Federick Barbarossa stayed here. As a Ghibelline municipality with a certain autonomy, San Miniato received numerous privileges from Emperor Federick II, who stayed there in 1226 and initiated an urban restructuring that was largely for military purposes. At the same time, he made it the Seat of an Imperial Vicar who was be forced to abandon Tuscany in 1284 after the defeat of Pisa, his most important protector, at Meloria. In 1291, San Miniato was united to the Guelph league headed by Florence, fighting with them in 1307 against Arezzo and the exiled Ghibellines. San Miniato was the scene of the territorial battles and devastation for all of the XIV C. In 1313 alone, it lost various territories that rebelled against its dominion or were conquered by Pisa. These territories re-entered its possession in 1317 as a result of the peace treaty concluded within its walls between the Tuscan communities, even though the controversies continued until the treaty of Montopoli in 1329. In 1347, it was placed under the direct dominion of Florence against whom it rebelled in 1367 on the instigation of Pisa. After a long siege, it was reconquered in 1370 by the Florentines who substituted the Nickname “al Tedesco” with that of “Fiorentino”. San Miniato was elected Seat of the Vicarate of the Valdarno Inferiore and remained from then on under the authority of Florence. In 1622, San Miniato obtained an Episcopal seat and title of City. A stay by Napoleon in 1797 persuaded many to enroll in the "Revolutionary" army. After an uncertain participation in the movement of ’48, San Miniato manifested support of Leopold II, soliciting at the same time the enactment of the constitution. Nevertheless, numerous individuals from San Miniato participated in the war of independence in 1859. From 1929, San Miniato developed a discreet, clandestine antifascist organisation and during the resistance formed a partisan brigade. Among its illustrious sons are Francesco I Sforza (1401-1466), the artist Ludovico Cardi called Il Cigoli (1559-1613), the architect Antonio Piccolini (1772-1850) and the philosopher Augusto Conti (1822-1905). 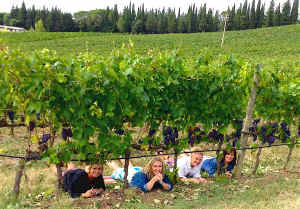 Off the beaten track tours! conducts small groups to Tuscan wineries, the Tuscan countryside and the Tuscan art cities in his air-conditioned car or minibus. The Tower, on the summit of the hill at an altitude of 192 metres, dominates the entire Valdarno. This tower was established in the 1200s but destroyed by the bombs during the last war. It was reconstructed in 1958. It is called “di Federico” because Federico II had it built. Palazzo dei Vicari, Otho I had it constructed in the XII century, incorporating one of the oldest known crenelated towers. The interior has frescoes. The Cathedral, named for Assunta and S. Genesio, it is a vast building that has been remodelled many times. The Matilde Tower, the most ancient tower of the fortified complex, is the bell tower of the cathedral. The triple nave, Latin cross interior of the Cathedral preserves precious works of art from diverse eras. Diocese Museum of Sacred Art, where the works of Filippo Lippi, Neri di Bicci, Fra Barlomeo and other artists are on show. S. Domenico, a church with an incomplete façade, of extremely ancient establishment, was constructed in the 1300s. Among other important works is a terracotta by Luca della Robbia. Click here for vacation rentals in Tuscany - luxury villas, village apartments, Bed and Breakfast, an agriturismo with pool. Click here to learn more about the truffles of San Miniato. Vorresti pubblicizzare la tua attività su questo sito web per San Miniato e ricevere traffico in entrata dalla nostra rete di più di 50 portali relativi? Clicca qui per ulteriori dettagli in merito alla nostra soluzione integrata per una presenza su internet piena di successi. San Miniato © ammonet InfoTech 2005 - 2018. All rights reserved.